No two humans are exactly alike. Even twins, who share physical traits and birth date, are very unlike each other. Everyone has their own likes and dislikes in terms of their food choices, fashion choices and so on. So what is it that decides these choices? Are they a result of our personality? And if this is true, then isn’t it natural that we can predict about your personality based on your choices? 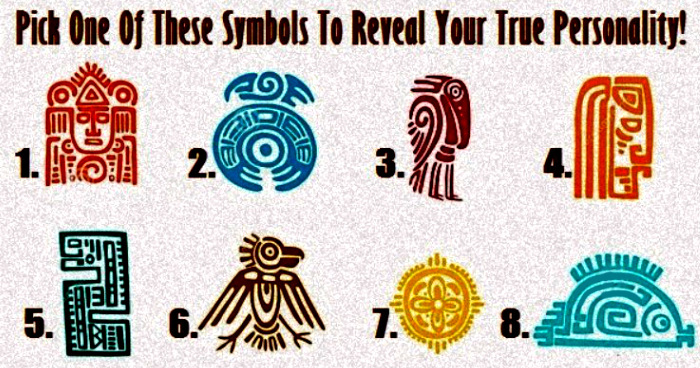 So here is a fun test in which you have to pick one of the following eight symbols, whichever appeals to you the most, and we will tell you about your personality. 1. If you zoned in on the very first picture, it means that you are ambitious and willing enough to put the hard work which is needed to turn your dreams into reality. You are honest and willing to give others a helping hand if they need it. Though, sometimes it is tricky for people to be able to reach out to you, but that can be remedied. 2. If you connect with the second symbol the most, it implies that you are one among those who thrive on sincerity and responsibility. And people know this and trust you implicitly, because they know if something is assigned to you, you will finish it with dedication and honesty. You are also a fast thinker. Another reason why you are a workplace favorite is because you always have something interesting to tell others. 3. Those who pick the third picture mostly turn out to introverts, and don’t prefer large companies. However, give them people who think like them and they’d be happy as clams. They are also very bright and creative and their mind is always whirring thinking of new ideas. They are also very morally upright and don’t fear to stand up for things which they believe in when required, even if the majority of the people are opposed to the same idea. 4. The ones who chose the fourth symbol are a bit of a mystery to their fellow men and women. They are highly intuitive and would also appear as crazy and quirky to the outsider. However, they also tend to get emotional and get hurt easily if there are misunderstandings. They also function well creatively when they can have their own space, as too much company cramps their thought process. 5. If you have picked the fifth symbol, that means you are your own individual. You don’t depend on others either for help or happiness. You know exactly what you want in life, how much time and effort it will take to get there and what you’ll do next when you have achieved it. Your family and friends look up to you for support. The only thing you want in return from them is complete honesty. And as cruel and hurtful the truth can be sometimes, you accept the truth and you remain strong as always. 6. If you chose this symbol, that means that you are a people’s person. People like being around you, it feels warm and fuzzy, and they feel naturally relaxed in your company. The reason is because you genuinely love and care for them and would like to be loved back in return. However, you are among those pure souls who don’t take away their love just because it is not reciprocated. 7. You are one of those crazy souls who live in the moment and come up with the craziest of things. There is never a dull moment when you are around and that is why everyone is so eager to be around you. Your loving and fun personality has a positive impact on everyone around you. You are true and loyal until the end to your closest people. Whenever something interests you, you try to gain all the knowledge about whatever has got your interest at the moment. 8. You are truly grateful for the life you’ve got and believe in making the best out of the days which have been allotted to you. You also don’t waste time and energy in hiding your emotions and tell people about your feelings. Your view and attitude towards life is a very healthy one and you are very proud of yourself and of all your achievements and life choices.